Brian H. Cosby (Ph.D., Australian College of Theology) is pastor of Wayside Presbyterian Church (PCA) on Signal Mountain, Tennessee and author of Giving Up Gimmicks: Reclaiming Youth Ministry from an Entertainment Church (P&R). 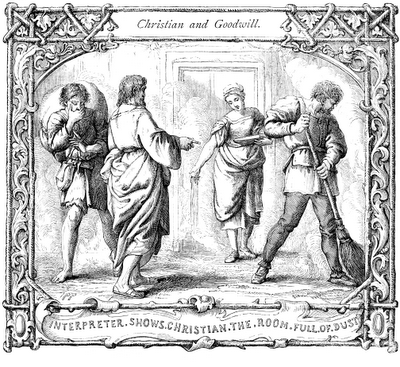 Then he took Christian by the hand and led him into a very large reception room that was full of dust because it was never swept. After he had examined the room for a little while, the Interpreter called for a man to sweep. When he began to sweep, the dust began to fly around so much that Christian was almost choked by it. Then the Interpreter said to a girl standing by, “Bring water here and sprinkle the room.” And when she had done it, the room was easily swept and cleaned. When I first started writing here, I was a little unsure of how to follow other blogs, how to allow access for people to follow my own blog, and generally all things related. Recently (and way overdue), I’ve included a couple new ways to make it easier for you to follow here. On the top right of the page, you’ll see 2 options. One is an orange RSS button that will take you to the page feed. Clicking on this will give you an address to copy and paste into your news feed reader (Google Reader [which is shutting down in July], Microsoft Outlook, Feedly, or whatever you may want to use) or you can simply click the “Subscribe” button on the feed page and it will store the page as a bookmark. Another way to follow is via email. Simply enter your email address and click on the subscribe button. WordPress will send you an email asking you to confirm your subscription request. Click on their confirmation and you will receive emails when new posts are made. Finally, there’s social media. You can follow along via Twitter @votblog or via Facebook through their Networked Blogs app, just search for the blog. Hope this helps you in your journey to follow other blogs/news feeds as well. I know for myself, it was a confusing maze of “how to’s” early on. And, as always, feel free to leave comments.